This photograph shows Lieut. Clede R. Keller, 1892-1918. The son of Eli and Laura B. Keller was born on March 15, 1892 in Webb City, Missouri. 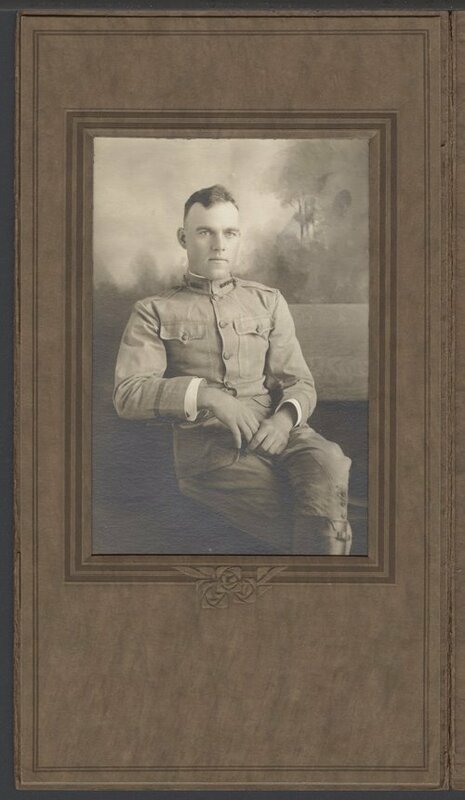 Keller's military service began on March 10, 1911 as a private in the Kansas National Guard Company First Regiment at Manhattan, Kansas. He was commissioned second Lieutenant by Kansas Governor Arthur Capper on February 4, 1915. Keller was later promoted, on October 1, 1915, as second Lieutenant of Cadets at the Kansas State Agricultural College. During the latter part of 1916, he saw active service on the Mexican border. He was mustered into federal service, on August 5, 1917, and received a first Lieutenant commission in April of 1918. Keller's service in France was with the 137 Infantry Regiment 35th Division. Lieut Keller died of wounds received in action on September 29, 1918 and is buried at the Meuse-Argonne American Cemetery in Romagne, France.